Curly Bird Express: Pink Fog! I'm in a Pink Fog, it's a good fog though! 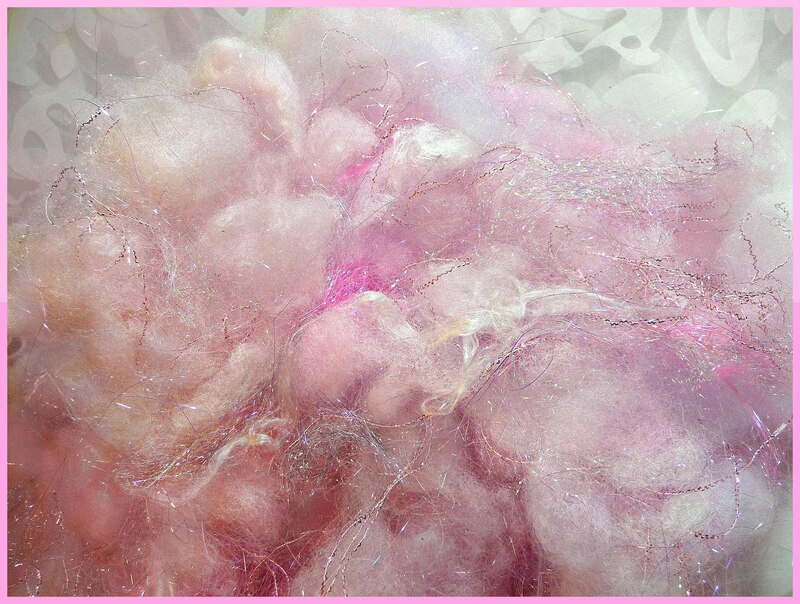 I've dyed some of gorgeous alpaca in shades of soft pinks and orchid, then I tossed in some of my new custom blend of Angelina sparkles, FaeriePrincess and PixieDust, plus beautiful, glossy silk fiber and pale pink Pizzazz sparkle fiber. Ooo, it's good enough to dive in and go for a swim, I love it! All super soft fibers, these alpaca/silk spinning clouds dance really well together! So well, that I had to drop everything and dance some up onto my bobbin! I played around with the single, making it fatter and thinner to see how it worked up. I even did some core spinning, I like it every-which-way, it's pink, soft and sparkly, what's not to love! 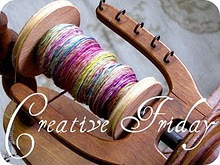 I was super busy with fiber activities this week, but I'm too tired and lazy to post any more pictures! haha! I hope you had a wonderful and creative week! Of course you know that I'm going to say that you can never go wrong with Alpaca ;-) Your colors are beautiful. I love that shade of pink plus your Angelina rocks. I've been using the gorgeous blend you gave me last spring and it just makes the batt and the yarn pop. 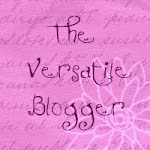 I love the fibers and yarn too, even if they are pink. (my least liked color). I can imagine them in other colors. Keep on blending and spinning. I love the fibers and yarn, even if they are my least liked colors. I can imagine them in other colors. Keep on blending and spinning. mmmmmm.....so soft and luscious. You make pinks come to life. Pink cloud for sure, it is gorgeous. I love the sparkle. I want that yarn in my stash, nay - on my knitting needles! Your core spinning is just great. So smooth and even! This is like, the best imaginable fog! 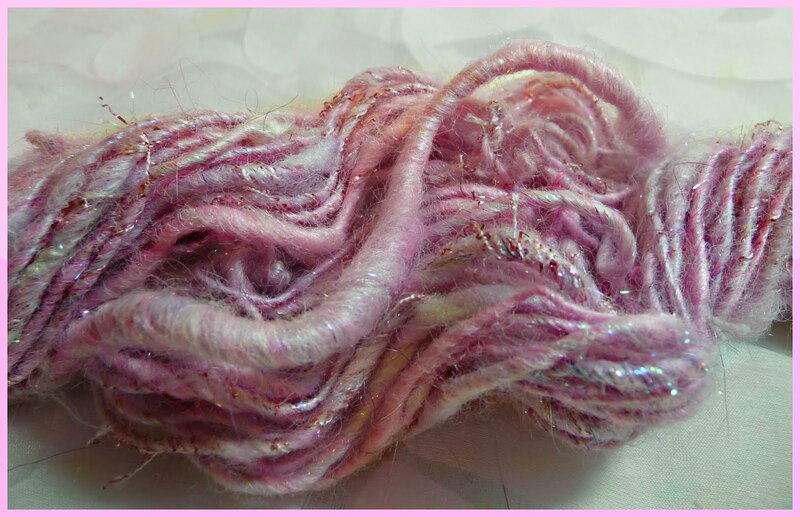 The fiber looks like a dream, and it's so lovely all spun up, really sweet and fairy-tale and playful! I'd love to have a scarf made with it.